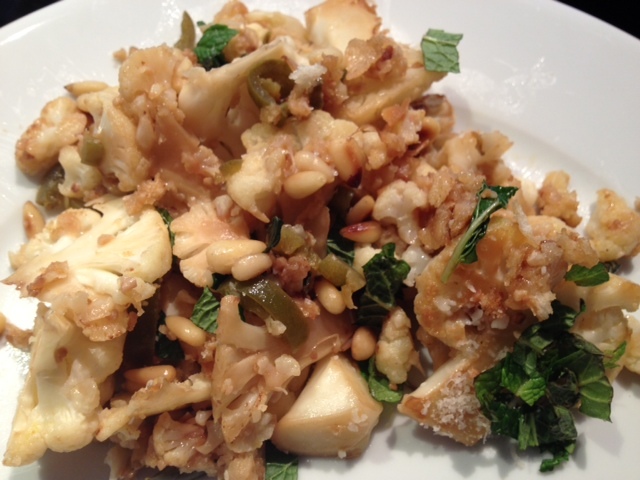 Girl & The Goat’s Cauliflower. 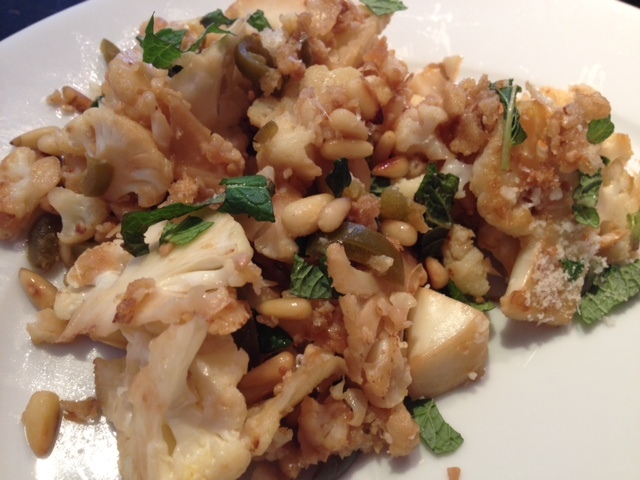 Girl & The Goat’s Pine Nut, Pickled Pepper and Mint Cauliflower. This is one of my favorite dishes from Girl & The Goat. The flavors are so unique and are amazingly delicious. Instead of waiting 3 months until my next reservation to eat it again, I decided to give it a try at home. I even found a video online of the chef, Stephanie Izard, cooking it! I made just a few changes to how she makes it, and although it could never be as good as Stephanie’s, it was still so, so good! Heat 1 tbsp of olive oil on medium heat. Once the oil has heated, add in the chopped garlic and stir it around for about 20 seconds. 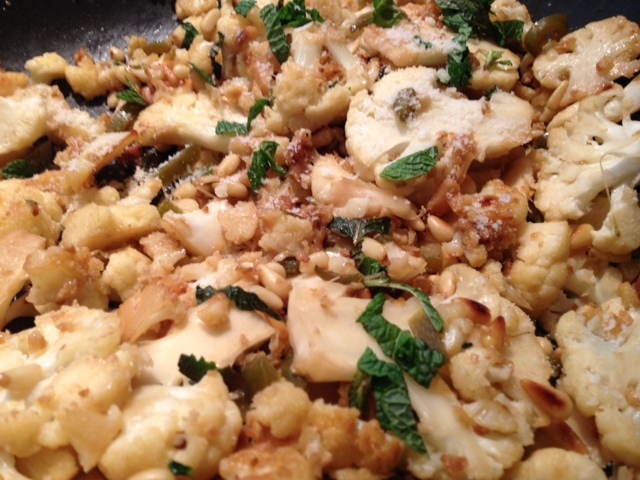 Once the garlic has begun to brown, add in the cauliflower and cook for about 10-12 minutes. 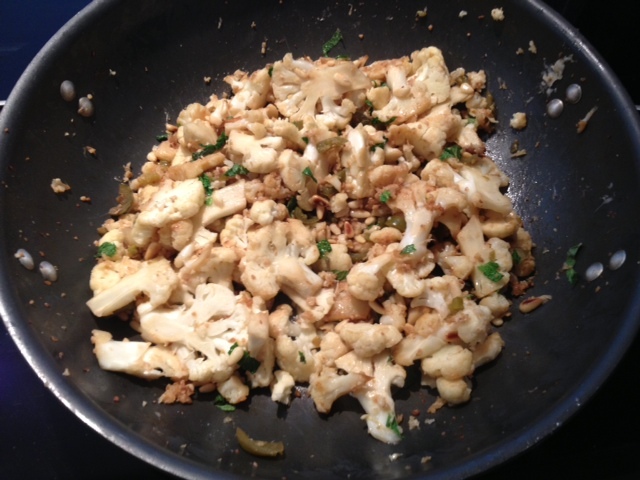 Stir the cauliflower often, and if it sticks to the pan at all, add in splash of vegetable stock. The vegetable stock also helps to remove some of the carmelization from the bottom of the pan which will help to add flavor. 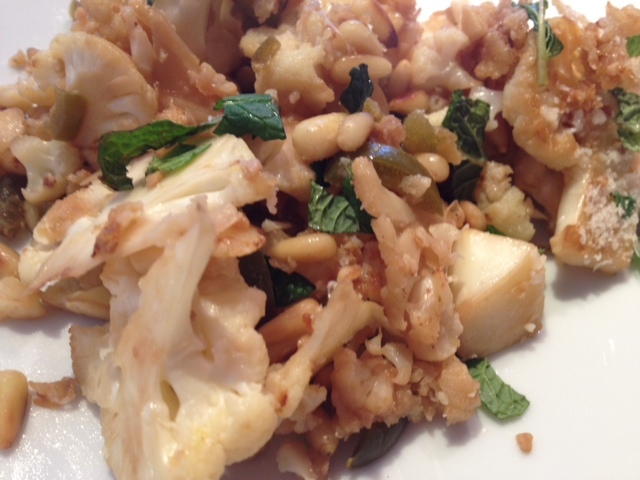 The cauliflower should begin to lightly brown. 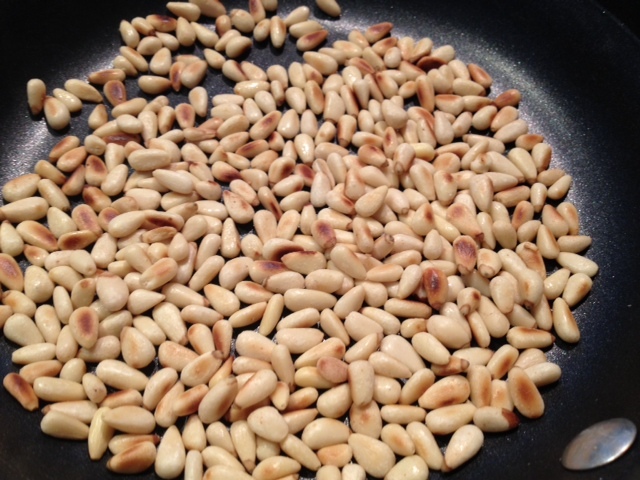 While the cauliflower is cooking, toast your pine nuts by putting them into a pan on medium heat (no oil). Without moving them, cook for about 2 minutes, and then stir them around a bit and cook for 2-3 more minutes so they can toast evenly. Be careful to make sure that they don’t burn. After the cauliflower is browned, add in the pine nuts, jalepeno peppers, light butter, Parmesan, panko bread crumbs and a dash of garlic salt. Stir all the ingredients to combine and to melt the butter. Right before serving, toss in the mint. ← Super Delicious Sweet & Sour Chicken.